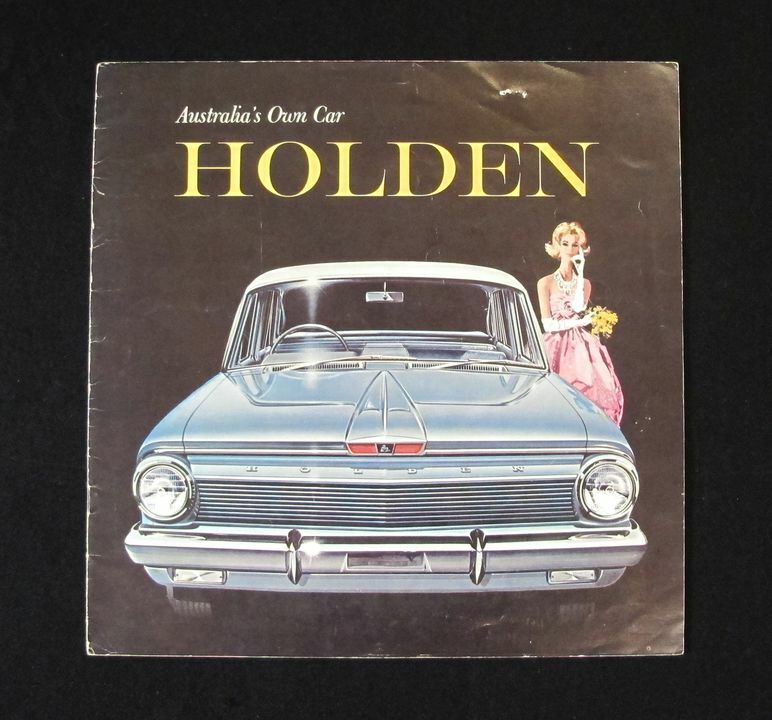 This archive relating to the Australian car manufacturing company, General Motors-Holden’s Limited (GM-H), covers paper material produced by and about the famous Holden firm from 1948 until 2010. Of particular importance are the 78 original advertising brochures and booklets devoted to particular models. These include a cavalcade of iconic Holden cars from the FJ to the Kingswood and from the Monaro and Torana to the Commodore. This collection of advertising trade literature comprises 78 booklets relating to specific models made by GMH Holden Ltd between 1948 and 2010 and 49 other pieces of documentation relating to Holden anniversaries, articles, model cars and other promotional material . 1. Apollo 1991. Sedan and wagon. 'New fuel injected Holden Apollo. Apollo SL, Apollo SLX, Apollo GS, Apollo SLE.' Colour illus. 1 sheet. 2. Astra 1987. 'New Holden Astra'. Advertising leaflet. Colour illus. Includes some specifications. 1 folded sheet. 3. Astra 1999. 1.8l engine. 'Holden Astra'. Advertising brochure. Includes 1 folded sheet 'New Holden Astra; a stunning success story that keeps getting bigger'. Colour illus. Includes specifications. 20pp. 4. Astra 2002. 1.8l and 2.2l engine. 'Holden Astra'. Advertising brochure. Colour illus. Includes specifications. 24pp. 5. Astra 2004. 1.8l engine. 'New Astra'. Advertising brochure. Colour illus. Includes specifications, exterior and interior colour chart and newspaper review. 20pp. 6. Barina 1994. 1.2l, 1.4l and 1.6l engine. 'All new Barina; Swing, City, Joy, GSi'. Advertising brochure. Colour illus. Includes specifications. 20pp. 7. Barina 1994. 'What's been missing in small cars?' Advertising leaflet. 1 folded sheet. 2 copies. 8. Barina 1996. 1.2l, 1.4l and 1.6l engine. 'Barina; Swing, City, GSi'. Advertising brochure. Colour illus. Includes specifications. 16pp. 9. Barina 2001. 1.4l engine. 'Holden Barina'. Advertising brochure. Colour illus. Includes specifications and exterior/interior colour chart. 20pp. 10. Barina 2001. 1.4l engine. 'All new Barina'. Advertising folder contains brochure, leaflet, 2 single sheets of reviews. Includes specifications. 11. Barina 2004. 1.4l and 1.8l engine. 'Holden Barina'. Advertising brochure. Dealer's card attached. Colour illus. Includes specifications. 20pp. 12. Calais 1987. 5.0l and 6.0l engine. 'Holden Calais'. Advertising brochure. Colour illus. Includes specifications. 12pp. 13. Calais 1991. Sedan. 'New Holden Calais with independent rear suspension'. Advertising brochure. Colour illus. 2pp. 14. Calais 1997. 3.8l engine. 'The all new Holden Calais'. Advertising brochure. Coloured illus. Includes specifications. 24pp. 15. Calais 1999. 3.8l and 5.7l engine. 'The new Calais series II'. Advertising brochure. Colour illus. Includes specifications. 24pp. 'Holden Commodore, Calais & Ute exterior colour & interior trim guide' attached. 16. Calais/Berlina 2002. 3.8l and 5.7l engine. 'Calais/Berlina'. Advertising brochure. Colour illus. Includes specifications. 24pp. 17. Calais Berlina 2006. 3.6l and 6.0l engine. 'Holden Calais Berlina; go to the next level'. Advertising brochure. Colour illus. Includes specifications. 6pp. 18. Camira 1983. Sedan and wagon. 'Supercar sedan and wagon; Holden Camira Car of the Year'. Advertising brochure. Colour illus. Includes specifications. 1 folded sheet. 19. Camira 1986. 1.8l engine. Sedan and wagon. 'Holden Camira'. Advertising leaflet. Includes specifications. 1 folded sheet. 20. Commodore 1978-2003. Commodore 25th Anniversary. '25 Years of Commodore'. Booklet. Colour illus. 20pp. 21. Commodore 1978.' To the householder; introducing a new kind of car for Australia'. Advertising leaflet. Colour illus. Includes some specifications. 8pp. 22. Commodore 1979. 2.85l and 3.3l engine wagon. 'Holden Commodore Wagon'. Advertising brochure. Colour illus. Includes specifications. 12pp. 23. Commodore 1979. 3.3l, 4.2l and 5.0l engine. Sedan, van and wagon. 'Presenting the exciting Holden range. Your guide to Australia's best-selling cars.' Advertising brochure. Colour illus. 12pp. 24. Commodore 1980. 1.892l engine. Sedan and wagon. 'Holden Commodore 4-Cylinder'. Advertising brochure. Colour illus. Includes specifications. 20pp. Also inserted: newspaper review and dealer's handwritten calculations for quotes. 25. Commodore 1981. 1.9l and 2.8l engine. Sedan and wagon. 'Holden Commodore; the advanced Australian'. Advertising brochure. Colour illus. Includes specifications. 28pp. 26. Commodore 1981. 2.8l and 3.3l engine. Sedan and wagon. 'Holden Commodore II'. Advertising brochure. Colour illus. Includes specifications. 24pp. 27. Commodore 1981. 1.9l and 2.8l engine. 'Holden Commodore, the Advanced Australian'. Advertising leaflet for SL and SL/X wagons. Coloured illus. 1 sheet. 28. Commodore 1984. 3.3l and 5l V8 engine. 'Australia's World Class Cars; Holden Commodore. Holden Calais.' Advertising brochure. Colour illus. Includes specifications. 32pp. 29. Commodore 1986. 2.9l engine. Sedan and wagon. 'Introducing New Holden Commodore'. Advertising leaflet. Colour illus. Includes specifications. 1 folded sheet. 30. Commodore 1986. 'Holden Commodore Accessories'. Advertising leaflet. Colour illus. 1 sheet. 31. Commodore 1988. 3.8l engine. Car and sedan. 'The Big V6 Holdens'. Advertising leaflet. Includes some specifications. Colour illus. 1 folded sheet. 32. Commodore V6 1991. 3.8l V6 and 5l V8 engine. 'New Holden Commodore V6. A world of difference'. Sedan and wagon. Advertising brochure. Coloured illus. 14pp plus foldout specifications. 33. Commodore V6 1991. 'New Holden Commodore V6. A world of difference'. Advertising brochure. Colour illus. 4pp. 34. Commodore 1991. 'New Holden Commodore's IRS proves itself in one of the harshest environments'. Advertising sheet. B&w illus. 1 p.
35. Commodore 1991. Sedan and wagon. 'New Holden Commodore V6. A world of difference'. Advertising leaflet. Colour illus. 1 folded sheet. 36. Commodore 1997. 3.8l and 5.0l engine. 'The all new Holden Commodore'. Advertising folder. Colour illus. Includes specifications. 28pp advertising brochure, 'The all new Holden Commodore accessories' booklet, 8pp, 'Holden SmartBuy; the smartest way to own a new car' booklet, 4pp, 'The GM card. No other credit card performs quite like it' leaflet, 1 folded sheet. 37. Commodore 1994. 3.8l and 5l engine. Sedan and wagon. 'The new Holden Commodore Series II. Executive, Acclaim, Berlina, S and SS'. Advertising brochure. Colour illus. Includes colour chart for exterior paint and interior trim. Includes specifications. 24pp. 38. Commodore 2002. 3.8l and 5.7l engine. 'Commodore'. Advertising brochure. Colour illus. Includes specifications. 32pp. 39. Commodore Series 2003. 3.8l and 5.8l engine. Sedan. 'Commodore series II". Advertising brochure. Colour illlus. Includes specifications. 32pp. Sticker enclosed. 40. Cruze 2002. 1.5l engine. 'All Wheel Drive lets you cruze'. Advertising brochure. Dealer's card attached. Colour illus. Includes specifications. 16pp. 41. Drover 4WD. 1.3l engine. 'Holden Drover 4WD'. Advertising brochure. Colour illus. Includes specifications. 12pp. 42. EJ 1962. 138 cu. in. engine. Sedan and wagon. 'Australia's Own Car; Holden'. Advertising brochure. Colour illus. Includes specifications. 12pp. 2 copies [one includes dealer's costing notes]. 43. EJ 1962. 149 cu. in. engine. Sedan and wagon. 'The new HOLDEN, Australia's own car'. Advertising brochure. Colour illus. Includes specifications. 8pp. 44. EK 1961. 138 cu. in. engine. Sedan and wagon. 'HOLDEN, Australia's own car'. Advertising brochure. Colour illus. Includes specifications. 16pp. 45. Ecoline. Advertising leaflet for Holden Ecoline range for better fuel efficiency. Colour illus. 1 folded sheet. 46. FC. 'A personal touch for your new Holden'. Advertising leaflet for approved Nasco accessories. Illus. 1 folded sheet. 47. FC 1958. Sedan and wagon. 'Australia's own car'. Advertising brochure. Colour illus. Includes specifications. 12pp. 48. FE 1956. Sedan. 'The new Holden'. Advertising brochure. Colour illus. Includes specifications. 16pp. 49. FJ 1953. 132.5 cu. Engine. Sedan. 'Australia's Own Car'. Advertising brochure. Colour illus. Includes specifications. 20pp. 50. FJ 1953. 132.5 cu. in. engine. Utility and panel van. 'Holden, Australia's Own Utility; Australia's Own Panel Van'. Advertising brochure. Colour illus. Includes specifications. 8pp. 51. Gemini 1983. 1.6l and 1.8l engine. Sedan and wagon. 'Holden Gemini'. Advertising brochure. Colour illus. Includes specifications. 20pp. 52. Gemini 1985. 'The all new Holden Gemini; reliability is back in style'. Advertising leaflet. Colour illus. Includes some specifications. 1 sheet. 53. HD 1965. 149 cu. in. engine. Sedan and wagon. 'HOLDEN, a look apart - a leap ahead'. Advertising brochure. Colour illus. Includes specifications. 16pp. 54. Holden 1948. 132.5 cu. in. engine. Sedan. 'Australia's Own Car'. Advertising brochure. Colour illus. Includes specifications. 8pp. 55. Holden 1992. Various models. 'Holden worldwide resources. World class cars'. Advertising leaflet. 1 folded sheet. 56. 'The Holden heritage'. Booklet. B&w illus. Colour photos on cover. 96pp. 57. HQ series. 'Holden owner manual'. B&w illus. 100pp. 58. HZ series. 'Owner manual; important operating safety & maintenance instructions'. B&w illus. 112pp. 59. Kingswood 1971. 173 cu. in. engine. Sedan and wagon. 'Holden, the great way to move'. Advertising brochure. Colour illus. Includes specifications. 32pp. 60. Kingswood and Belmont 1971. Advertising leaflet for utilities and panel vans. Colour illus. Includes some specifications. 1 folded sheet. 61. Monaro 2004. 5.7l engine. 'Monaro'. Advertising brochure. Colour illus. Includes specifications. 16pp. 62. Monaro 2003. 'Monaro'. Advertising leaflet. Colour photos. 1 folded sheet. 63. Premier 1962. 161 cu. In. engine. Sedan and wagon. 'Turbo-smooth HOLDEN, Australia's own car'. Advertising brochure. Colour illus. Includes specifications. 16pp. 64. Premier 1967. 161 cu. in. engine. Sedan and wagon. 'The new generation Holdens; Premier, Kingswood, Belmont'. Advertising brochure. Colour illus. Includes specifications. 24pp. 65. Shuttle 1984. 1.8 cc engine. Delivery van. 'Shuttle from Holden'. Advertising brochure. Colour illus. Includes specifications. 8pp. 66. Statesman Caprice 1974. 'What is it that makes a car world class?' Advertising brochure. Colour illus. 8pp. 67. Statesman V8 1990. 50l engine. Sedan 'Statesman V8 by Holden'. Advertising brochure. Colour illus. 12pp plus foldout specifications. 68. Statesman Caprice 1992. 'Holden Statesman Series II. Holden Caprice Series II'. Advertising brochure. Colour illus. 4pp. 69. Suburban V8 1997. 5.7l and 6.5l engine. Wagon. Advertising brochure. Colour illus. Includes specifications and insert with colour options. 20pp. 70. Supercharged V6. 'The new Holden Supercharged V6; look how the experts reacted'. Advertising leaflet. Colour illus. 1 sheet. 71. Torana 1967. 70.7 cu ins engine. 'All new Holden Torana; the great escape'. Advertising brochure. Colour illus. 12pp. 72. Torana 1972. 'Make your Torana one-of-a-kind with personalised accessories'. Advertising brochure. Black and white illus. 12pp. 73. Torana SL 1976. 173 cu. in. engine. Sedan. 'Torana SL; Luxury at a price you can handle' Advertising leaflet. Colour illus. Includes specifications. 1 folded sheet. 74. Vectra 1997. 2.0l and 2.5l V6 engine. Sedan. 'The all new Holden Vectra sedan and hatch'. Advertising brochure. Colour illus. Includes specifications and exterior and interior colour chart. 20pp. 75. Vectra 1999. 2.0l 2.2l and 2.6l engine. Sedan and wagon. 'Holden Vectra; now with all the spoils'. Advertising brochure. Colour illus. Includes colour chart for exterior paint and specifications. 24pp. 76. Vectra 2003. 3.2l engine. Sedan. 'The all new Vectra CDXi'. Advertising card. Colour illus. 77. VT 1997. Sedan and wagon. 'Holden design'. Brochure. Includes colour illus. 20pp. 78. '2010 Range; Holden go better'. Advertising brochure. Colour illus. 24pp. Due to space constraints, the remainder of this list has been put in the Notes field. This collection is the result of putting aside Holden brochures on new cars over a 62-year period by curators in the Transport collecting area of the Museum. The brochures were stored in research files in the curatorial offices but have now been brought together and acquired into the Museum's permanent collection.